An unexpected four day weekend for my daughter ate into my blogging time, but you know what? 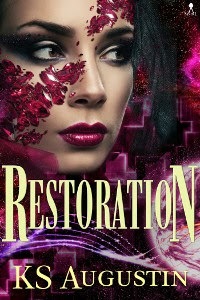 It's a great excuse to share the cover and blurb for RESTORATION, a new sci-fi romance release from KS Augustin! In politics, is there a place for love? Van Motaff, renowned philosopher and Rahfonist, is looking ahead to Retirement, but the planetary government has other plans. Something unprecedented has happened—a young, male Rahfoni has been raised by aliens for the past thirty years—and Van has been chosen to restore him to Rahfon society. Even though the eyes of two worlds are on her, Van thinks the job will be straightforward enough. But when her charge, Eton Abless, is injured, an irate governor interferes, demanding that the young man be neutralised as a potential political threat. Van resists and finds herself falling into a forbidden romance with her student…a romance that may mean the end of her reputation and career, and his permanent exile. As her options narrow, Van is forced to face the conclusion that the only way to save Eton may be to lose him completely. RESTORATION will have a special release price of $3.00 if you purchase it at Sandal Press (the RRP $5.99 starts April 2015 at all major retailers).